From Glad Rags to Glad Bags! Let’s shift to lifetime bags! Sue Nosworthy and Yuli Somme are hosting a two part FREE up-cycling workshop on Saturday 9th June at Bellacouche, Moretonhampstead. The morning workshop will run from 10am-12.30pm and the afternoon workshop will run from 1.30pm-4.00pm. Leaving an hours break for lunch. Tea, coffee and biscuits will be provided for free but please bring your own lunch if you are doing both workshops or visit one of the local cafes or shops for a delicious bite to eat! You can choose to do both workshops, adding the mornings’ work to the bag, or you can just do one of them. If you wish to do both please be sure to book both sessions. Either way, it’s all about up-cycling bits that would otherwise make their way for shredding…or worse: for landfill! This workshop is suitable for anyone age 12 upwards, no experience necessary. Let’s make something beautiful! 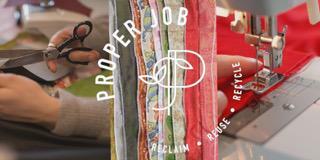 More details can be found on the Proper Job Facebook page or on the Proper Job website www.proper-job.org and click on workshops, or subscribe to our newsletter to stay updated on upcoming events. Alternatively you can call Alison Sallis 01647 432985 or drop into Proper Job’s Uptown store in Chagford Square.